You never get a second chance to make a good first impression. Where does your family congregate most often? Where do guest migrate when they visit your home? The kitchen! A beautiful new kitchen will always greet your family and guests with classic elegance and style. By updating key features like cabinets, flooring, and lighting, we will create a New Hampshire area kitchen remodeling project that leaves your family clamoring for more time together in their beautiful new space. Check out our kitchen gallery for ideas on how to make your kitchen more beautiful. Kitchens of the past were not built for comfort, but strictly built for function. This may present a challenge if you are seeking a kitchen that offers beauty, comfort and convenience effortlessly woven together creating a real sanctuary in your home. Modern kitchen floor plans make the maximum use of available space, and also incorporate designs that make this “heart of the home” a warmer and more welcoming room. A more welcoming kitchen will make it easier to host, whether that means simple family dinners are larger scale parties for extended family and friends. Real estate professionals have an eye for what people want in a new home, and they agree that an up-to-date kitchen is at the top of the list. Even if you are not planning to sell your home, a new kitchen makes day-to-day family life more pleasant and enjoyable. Just ensure you are getting the best value by investing in materials, fixtures and appliances that will stand the test of time. Saving a few dollars now by selecting an item that is “good enough” may end up costing you more in the long run. Choosing high quality materials and expert New Hampshire area kitchen remodeling service from G.M. Roth can dramatically add to the resale value of your home. With fuel prices still fluctuating, energy efficiency continues to be a high priority. Your old refrigerator, stove, microwave and dishwasher use too much energy. Most new kitchen appliances have earned the EnergyStar rating for efficiency as measured by the U.S. Department of Energy. That means you’ll get a better performance, use less energy, which ultimately will save you money. G.M. Roth has made it our mission to save local homeowners money on their monthly energy costs by designing efficient kitchen remodeling in NH. 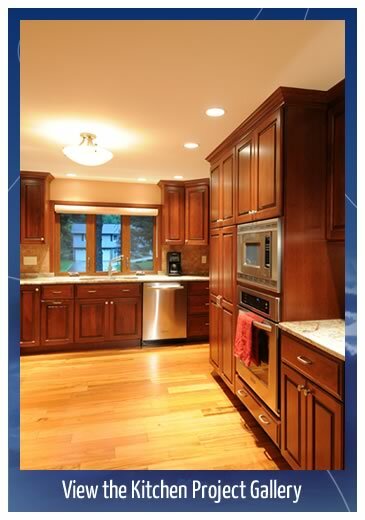 Call us today for more details on the wide range of benefits resulting from a remodeled kitchen! Let’s get started on your dream kitchen today! Let our team deliver your dream kitchen! Call G.M. Roth Design Remodeling today at (603) 880-3761 to schedule a complimentary in-home consultation with one of our talented designers.